For many people sorting out midnight military time can be a head scratcher. Terms like noon and midnight are generally used as part of the AM/PM time keeping system. When it comes to midnight, it is notated and referred to in a different way. So what is midnight military time? Should 12AM be notated as 2400 or 0000 military time? Below you will find an explanation and examples on how midnight military time works. Military time is a unique timekeeping system that is based on the 24 hour clock as standardized by ISO 8601. This standard notates midnight as both 0000 and 2400 but advises that 0000 is preferred as it generally refers to the start of a day. Many military personnel will see both 0000 and 2400 being used as a reference to the beginning or the end of the day. Which format is used can generally be reserved for if the day or activity in question is ending or starting at that time. It is important to note that military correspondence, emergency responders, and health services use both 0000 and 2400. Most electronics that track time use the 0000 notation. The day begins at 12:00AM (0000 – Midnight Military Time) and ends at 11:59PM (2359) in these devices. Any use of 2400 is mostly for the purposes of dictating the end of the day instead of the start which is dictated by 0000. Using railway time tables as an example, you will commonly see 0000 departure times but see arrival times notated as 2400 keeping with the theme of whether the time notates the beginning or the end of the activity. Additionally legal contracts in countries that use the 24-hour timekeeping system notate that a contract begins at 0000 and ends at 2400 at a future date. Report for duty at 0000 on January 7th. Your day will end at 2400 on January 7th. That job had weird hours, we would always have to start work at 0000. Convert military time using our simple tool. How to Pronounce or Say Midnight Military Time? 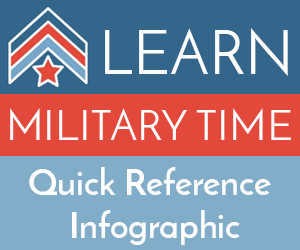 Want to learn more about reading and how to say military time? How to Read Military Time. The easiest know how to say and notate midnight military time seems to stem from if it is the beginning or the start of the event. If it is the beginning of the day, activity, or event then use 0000 (Pronounced: “Zero Hundred Hours” or “Midnight”). If it is the end of the day, activity or event then use 2400 (Pronounced: “Zero Hundred Hours,” “Twenty Four Hundred Hours,” or “Midnight”). Refer to our military time chart for easy reference.